The labels turned out so cute. Everything was perfect on them. Can't wait to use them. This is the first year I ordered labels just for Christmas. ?????? The labels are absolutely beautiful! A very nice way to dress up your holiday cards. Have loved these labels and seals for years..They make the Christmas envelopes so pretty..
Usefull all yr as a festive label. Purchased as a gift for a friend who lives in the UK.they don't have these there. I think these labels are beautiful. They finish off my Christmas card. I am using these address labels for my Christmas cards and they are perfect. I also ordered the seal for the back of the envelope and it adds the perfect touch. I love the holiday season and they were the right touch for my photo greeting cards! 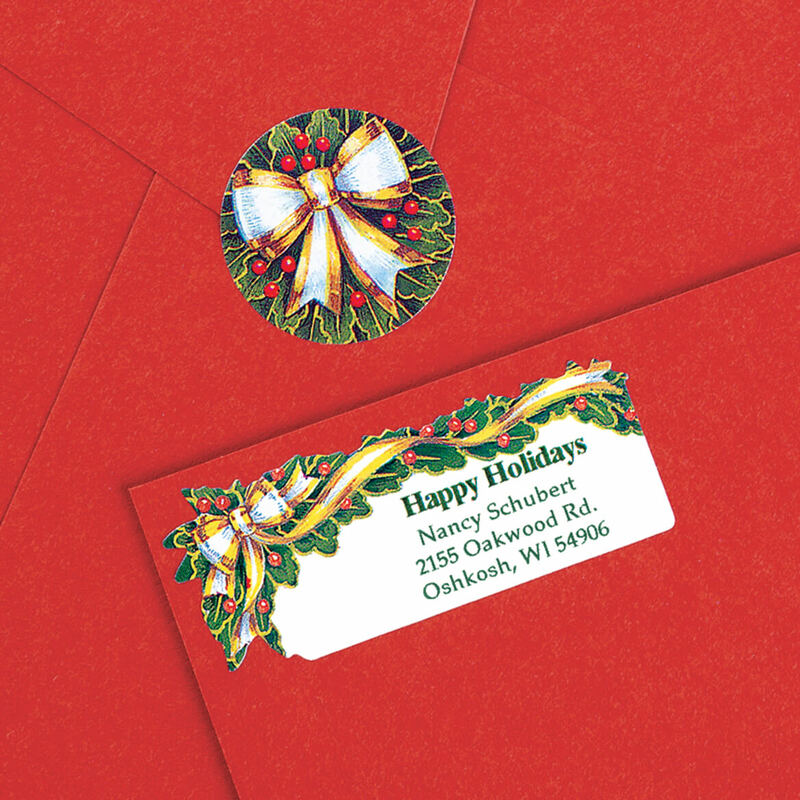 Helps speed time in getting Christmas cards or party invitations get out into the mail. These labels are awesome. The colors are very pretty. I will order again. The product is beautiful and very Christmas! Used them for several years and like them a lot. I have used your labels before and liked them. I have been a customer since about 1957. Because their for my Christmas Cards. Attractive Design and great price for the labels and seals. They are beautiful and well worth the very affordable price. I like to have a finished envelope and the labels and seals add a little pazza I look for. Your company has what I am looking for. Have used and loved for years. To make my life easier and for a festive touch to holiday cards. Less writing for me and also looks pretty. I have wanted a set of labels & seals for awhile and this fit the bill! 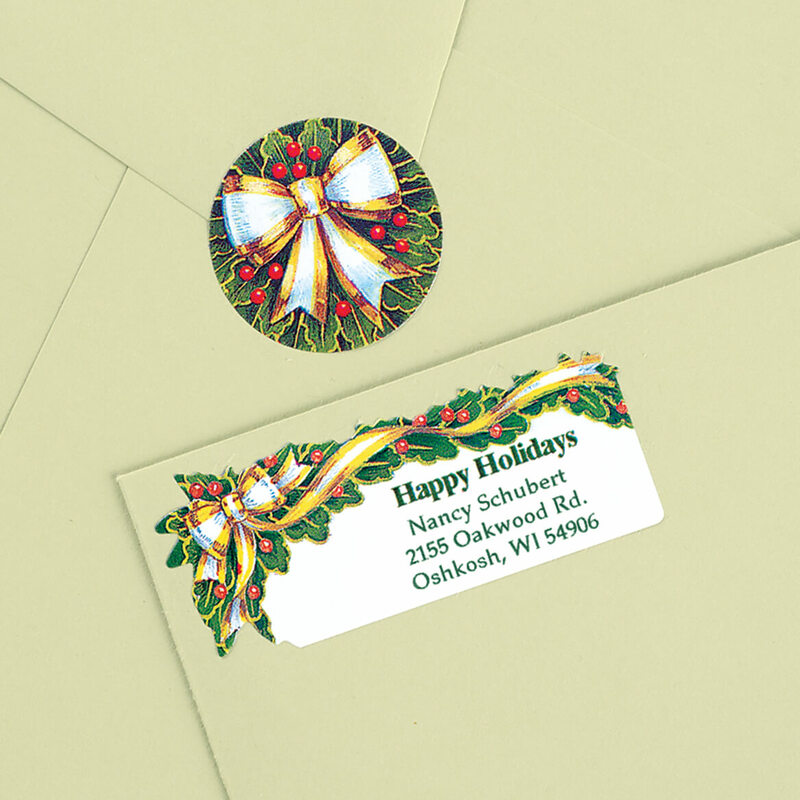 Loved the pattern and seals...want to use next Christmas on ALL my cards and letters. To-go with the 600 cards I ordered for next Christmas. Had these in the past, they make each Christmas card more festive. I've have almost run out of my previous order of Labels with matching seals. Love this new set. I think they are all very pretty, hard decision on which design I wanted. Had them before and love them. Good quality and beautiful pattern. Looks great on the Christmas cards. I had to pick something without religious reference; this works nicely. I like the "Happy Holidays" line and the ribbon is pretty! I think using matching seals with address labels makes the envelope look neat. I get my Christmas labels from Miles Kimball every year. They are good quality and a good price. I have used this same design in the past and love it! 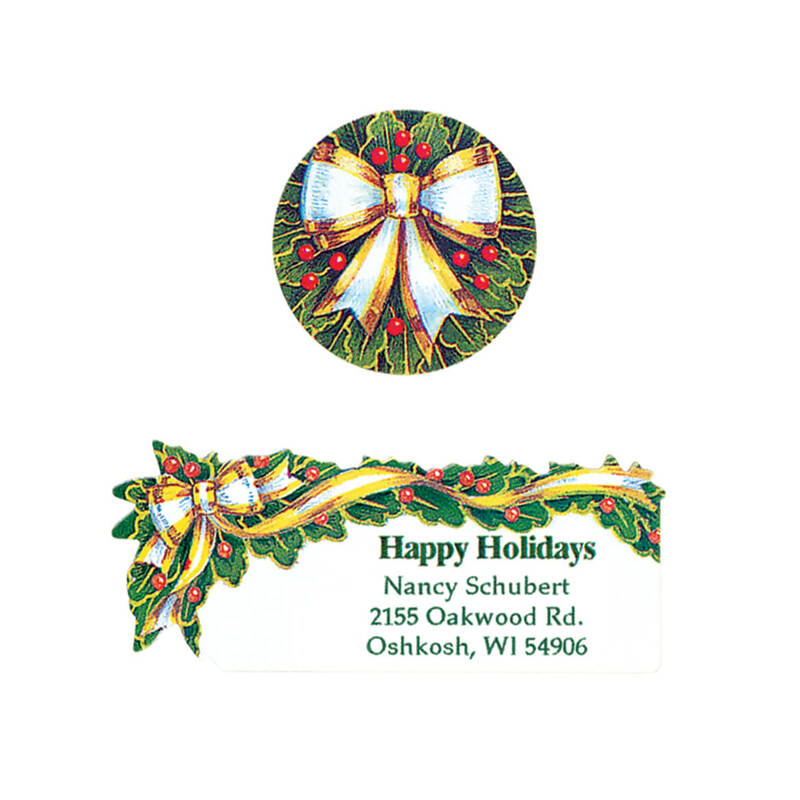 I have ordered these labels in the past, they are the most attractive Christmas labels available. Have used these labels for years. They are very pretty and help save time labeling my cards. I just want to put our name on them doin"t need the address can I do that? and that will center it (top/bottom) of label, under the Ribboned Holly. Hope this is clear and helps. Yes, these labels can be used however you want them to. They are able to be personalized just like you want them. Simply fill out the order form the way that you want them to read. They will be great for Christmas cards or anything really. We loved ours! Thank you for your recent question. You may personalize these labels however you would like, as long as you stay with in the maximum characters and spacing provided for each line provided. I Can't answer this particular question, but I will say this---this is the most attractive label I have ever seen which is the reason I have been using it for 10 years or longer---I am always pleased with Miles Kimball merchandise. Can you use four lines on lables? BEST ANSWER: You can fit 3 lines of personalized (name/address) information. The first line is part of the design: "Happy Holidays"
I am pretty sure it is three lines. How many labels are in #311853? BEST ANSWER: Thank you for your question. It is a set of 250 labels and seals. We hope this information will be of help to you.